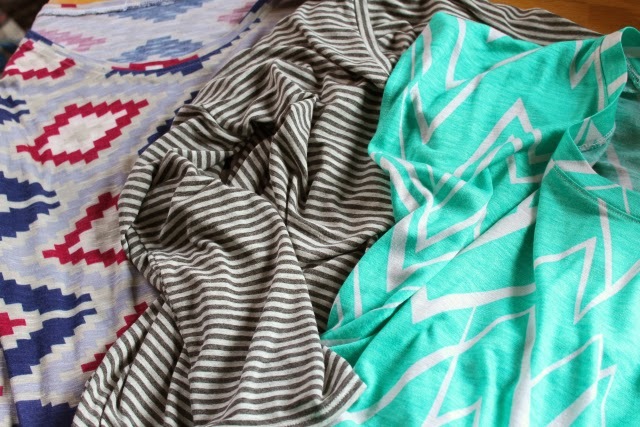 I had an epic jersey stash-busting sewing marathon this past week. I recently organized my sewing room (see proof here) and sorted my fabric by type/content as well as fabric-I-want-to-use and wtf-was-I-thinking-fabric. I actually don't have a large fabric stash right now (a subjective statement), but I thought it was about time I make some room for new stuff. I hate storing slinky fabric that doesn't fold crisply or stack well, so I grabbed all the drapey rayon/lycra blend jerseys that have been slipping off my narrow closet shelves for several months now. 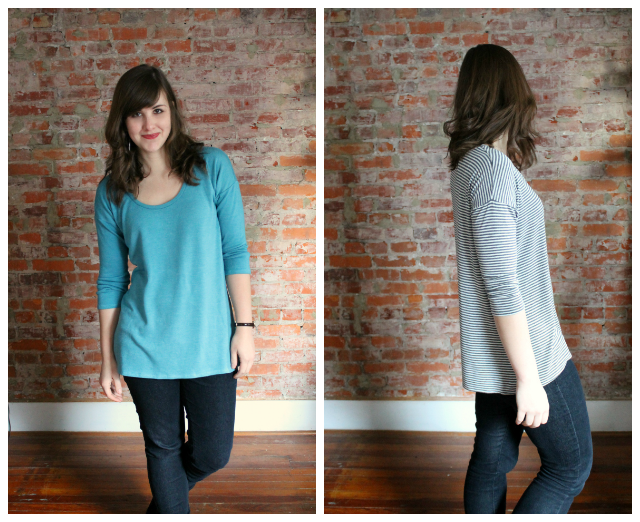 To help tackle all these knits, I downloaded the PDF of Grainline Studio's free Hemlock Tee pattern. It's a slouchy-fit, drop-shoulder top, which isn't necessarily the most flattering look for me, but hey, a girl's gotta lounge. I've been wearing jeans more often lately because all my tights are ripped so I can't wear dresses. 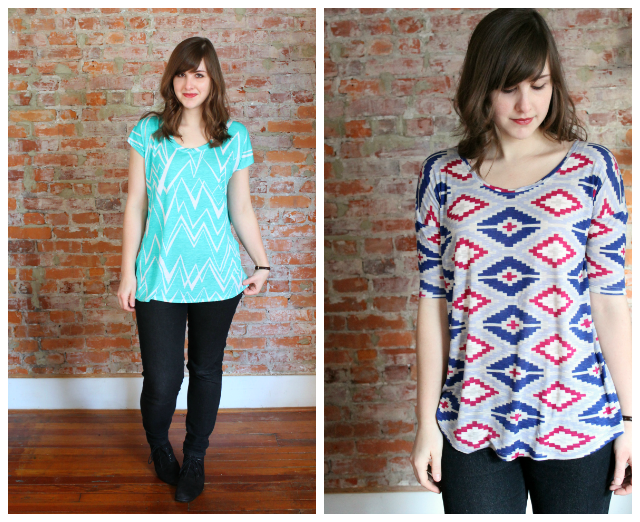 Instead of buying more tights, I'm sewing more tees so I can wear jeans more often. Hopefully someone out there gets my logic. 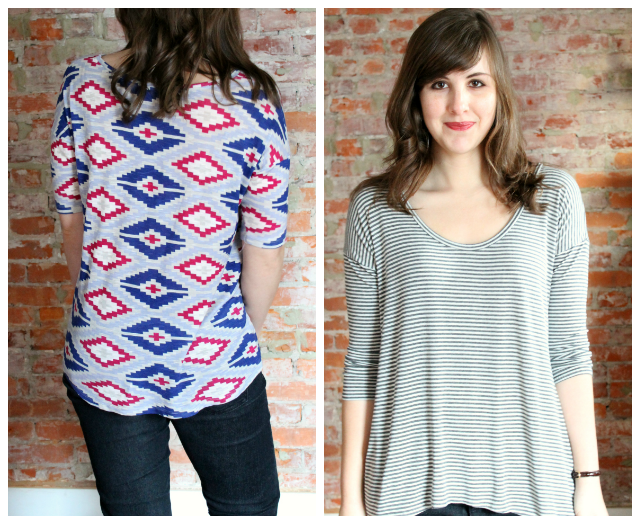 So all week I've been busting out Hemlock tees like it's my JOB. omg I wish that were actually my job. Please, someone. This pattern is drafted in one size and only includes three pattern pieces (front, back, and sleeve -- you draft the neckband yourself). 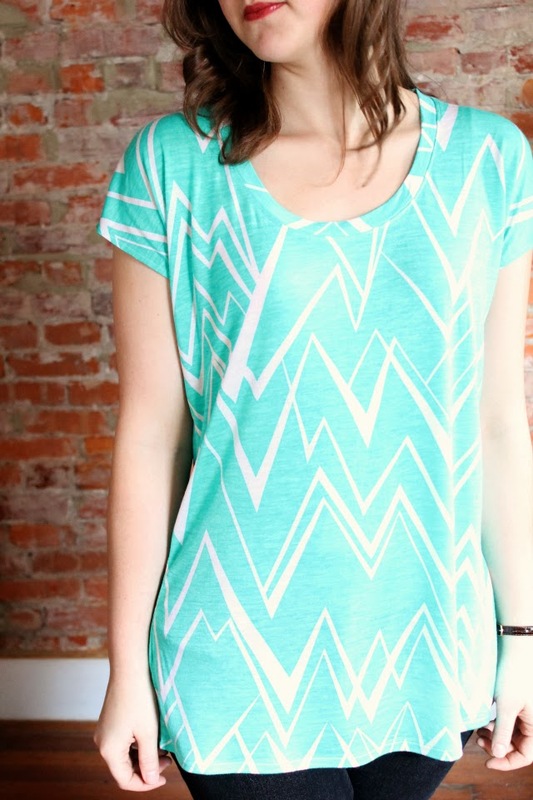 The instructions (provided in Grainline's post here) show you how to make the tee with a serger (overlocker). I almost always use my regular machine as well as my serger for construction on knits. I just feel like I have more control and dexterity with my machine, which helps when matching stripes, matching underarm seams, or attaching neckbands that need to be pretty precise. I made some modifications on all of these. On my first practice try, the neckline was too high for my liking and the sleeves too loose. Each of my subsequent necklines were lowered about 3 inches (!!scandal!!). I also lengthened each hem about 2 to 3 inches. The hem of the tribal/cross print one is curved up at the sides, and the hem of the striped one is curved up at the front and longer at the back. I used my coverstitch machine to hem everything. Ole Janome got quite a workout this week. I made slimmer elbow-length sleeves on the tribal print version, and slimmed down all the others so they could be scrunched up. And obviously I left off the sleeves on the zig zag print version to make a little kimono cap sleeve thing, extending the shoulder seams another inch. Oh go on, call me a ~designer~. 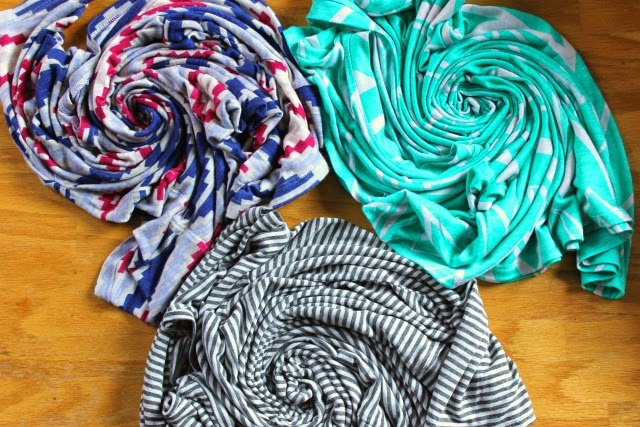 All three of the rayon jerseys (prints, stripes) are from Fabric.com bought within the last year. I originally intended the graphic print ones to be dresses, but they're certainly too lightweight and sheer for that. The tribal print one was advertised as blue and red, but it's definitely purple and pink. 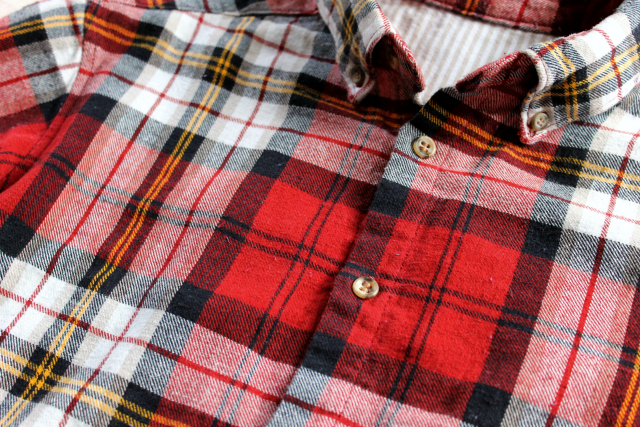 And totally printed off grain, as is typical of Fabric.com. Ah well. I made sure the pattern placement was alright so that I didn't have big crosses or pink diamonds directly on my b00bz. 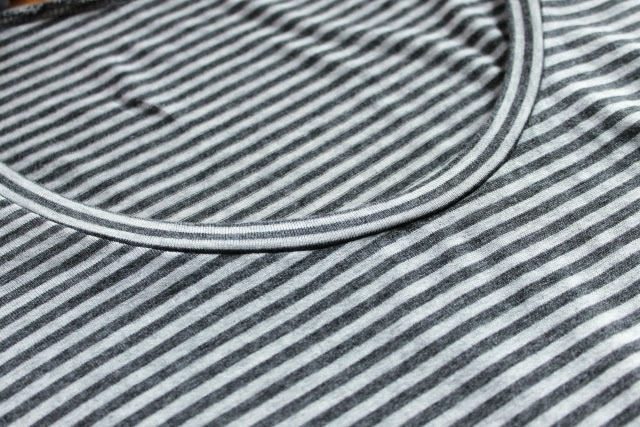 The gray striped fabric was going to be another Henley for Corey but he didn't like the fabric (what? Unbelievably picky, that guy). So now it's mine! I was inspired by Makes The Things' sweater version of the Hemlock tee pattern, so I decided to make a heavier version with this turquoise sweater knit fabric that sweet Handmade Jane mailed to me all the way from the UK last year just because she knew I liked it. Seriously. She's a sewing angel among mere sewing mortals. See the raglan sleeve dress she made with this same fabric here. Thanks again, Jane! This one's definitely the warmest version, and goes to show that you can make this pattern with thicker knits, as long as they still have a bit of drape or airiness so the drop shoulder doesn't look too bubbly and weird. 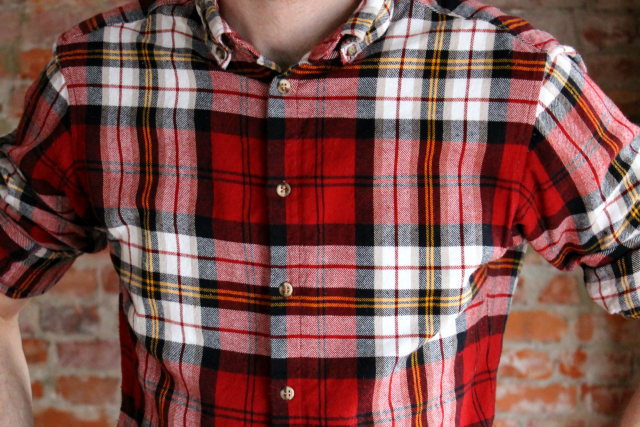 The Hemlock has you choose your desired neckband width. 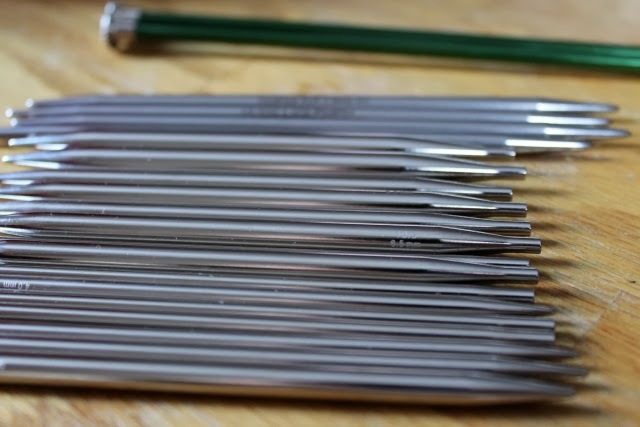 I used a 2" wide quilt building ruler to cut all my neckbands out. All of them are folded in half wrong sides together then sewn/serged to the neckline with a 5/8" seam allowance and pressed up, except the short sleeve zig zag one, which was sewn at 3/8". Two of them I topstitched down and two I did not. 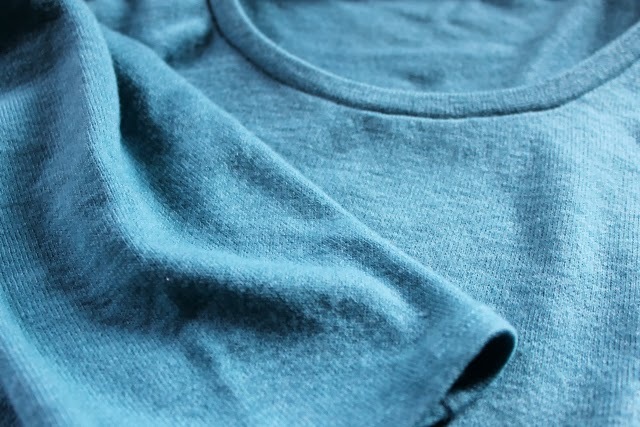 I ALWAYS attach my knit neckbands flat instead of in-the-round, then connect the second shoulder seam after the fact. 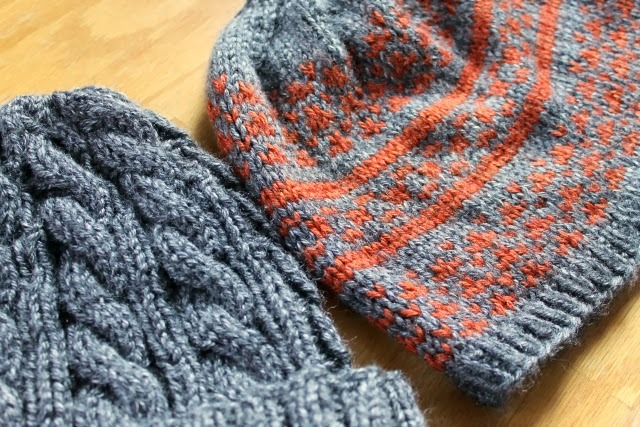 That way I can achieve my desired neckband snugness without doing any math or fiddly trial and error work. The Hemlock pattern obviously sews up very quickly, so I recommend it if you want to whip up some basics, need to get out of a sewing rut, sew up some of your jersey stash, or, as in my case, all of the above. I've already worn mine to work, to the movies, to the gym, and/or to bed. Multi-purpose, gotta love it. Thanks for another great little pattern, Jen B. You're a superhero. Who else is Hemlock crazed? Happy new year, sweet friends. I have some ambitious plans up my sleeve for the coming year, and I've always been inexplicably more fond of even numbers than odd numbers, so I think 2014 should be a good'un. 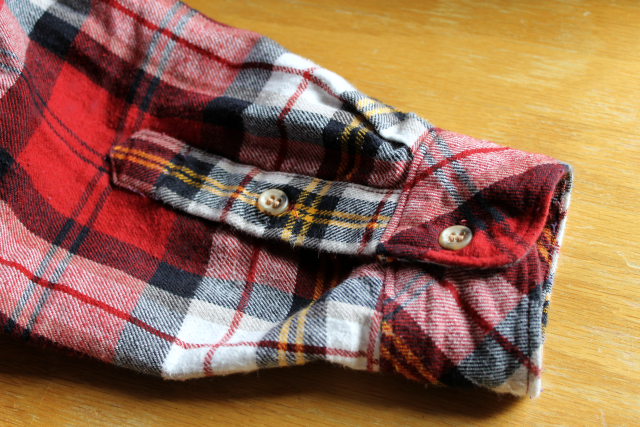 I didn't participate in all the bloggers' "top five"/reflection posts, but to seal up 2013, I thought I would share this plaid flannel shirt I made Corey in December. Last year was the year of the button-down, as I made five shirts and one shirt-dress for myself and four shirts for Corey. This one is definitely the most beloved. The button placket IS straight! 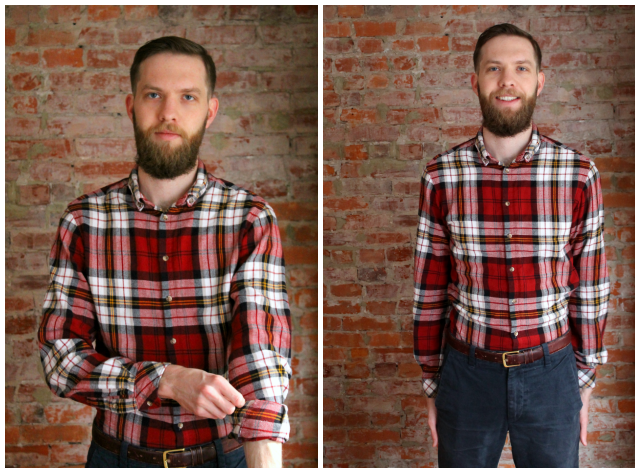 I think we all know there aren't great men's shirt patterns out there, so I've built this pattern using trace-offs of RTW shirts (for the front, back, yoke, collar/stand) and the sleeve and cuffs from Burda 7045. The Burda pattern seems to be okay because it's actually a slim modern cut, but it didn't have the back pleat or curved hem that Corey likes, and the collar options are somehow confusing. I think I'm pretty close to achieving his "perfect" pattern, but the sleeves on this one puff out a bit too much above the cuff. I also still cheat and simply serge all the seams instead of flat-felling or whatever, but I think I should at least do French seams because he always rolls up his cuffs. I was short on fabric so I had to cut the back yoke on the cross-grain, and the inner yoke out of a striped cotton sheet in my stash. The middle vertical stripe on the yoke therefore isn't the same width as the middle vertical stripe on the back, and the whole back print is kinda crooked (just now noticing, gah!) but O'WELL. The plaid matching on the front, sleeves and sides is pretty accurate so I'm happy. 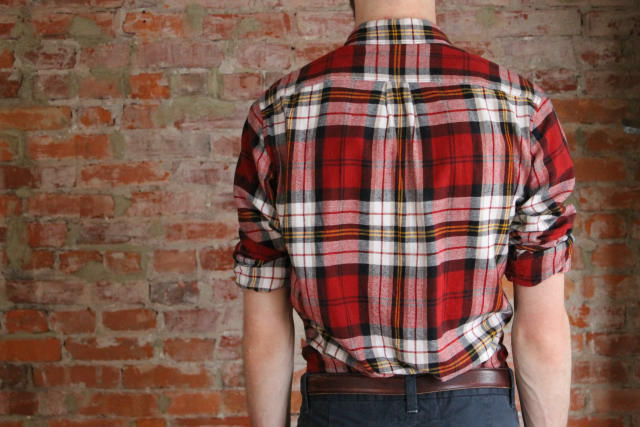 The fabric is a cotton flannel shirting from JoAnn's. They do tend to have attractive tartan plaids there. Honestly I wanted to make something for myself with this fabric, but he practically pounced on it the moment he saw it on my sewing table, and he's just so damn charming. I ain't mad, though, because his wardrobe is only a fraction of the size of mine so he actually needed another shirt in the winter rotation. Last week Corey flew back to Philly from Louisville during the winter weather chaos. His connecting flight was canceled and so they shuffled him around and got him on a late flight to a different PA airport. Not surprisingly, his baggage did not show up. They told him it'd be delivered the next day, but of course it wasn't. Days went by, and airline phone robots kept telling him that the bag had not yet been located. All I could think about was those beloved handmade shirts (four or five! ), trapped in a cold, dark suitcase, abandoned in airport limbo. Losing his favorite handmade clothes all at once would mean losing a large part of his carefully curated (and limited) wardrobe, which is devastating enough. 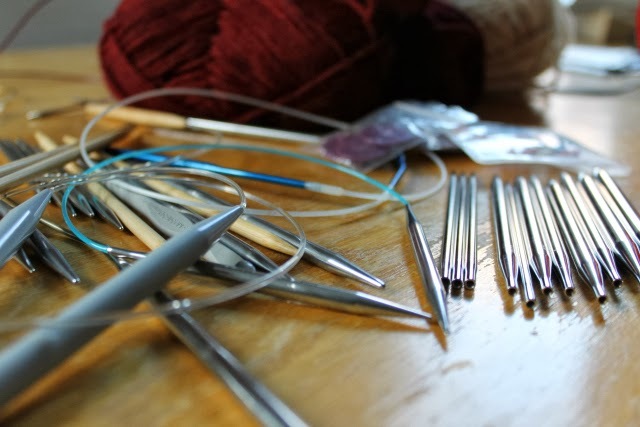 It would also mean that all MY laborious hours of love spent hunched over the cutting table and stepping on pins and slicing my hand with a rotary cutter would be a total, utter waste. But the story ends happily because the suitcase finally arrived after a week. Has an airline ever lost any of your baggage full of handmade items?! Anyway, that's the shirt. 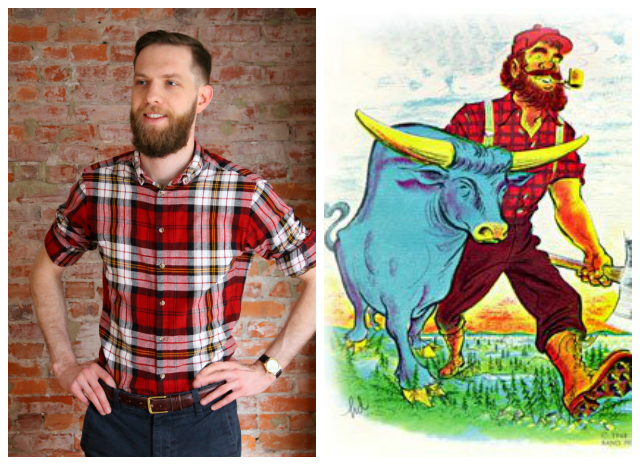 Does big-bearded Corey in a red plaid shirt remind you of anyone? I smell a Halloween costuuuume. I guess I'll be the ox sidekick because I'm such a babe.